The weather was an excellent metaphor for the librarian profession’s current status quo: the presence of smothering heat (budget cuts), the pros and cons of doing anything outside temperature controlled areas (movement and change versus consolidation and static), and everyone desperately wishing for a change in the climate (draw your own conclusions on that one). The only topic to be discussed more than the weather at the conference was that of change, at least at some of the sessions I attended and the circles I was socializing in. It was mentioned in the acceptance speech during the PLA awards in that “[the library profession] is a quickly changing field.” It was at this utterance that I stifled an eyeroll so strong that I was assured to be rendered blind if I allowed it to happen. But I digress. One of the highlights of the conference for me was the RUSA President’s Program “For the Love of Reference”. I had never heard Nancy Pearl speak before, but it’s always great to hear my friend Pete Bromberg present. I had an idea of what he was going to cover since he had asked me if he could use my Library Day in a Life Round 4 entry. (Here’s a previous thought on reference posted back in April.) Pete really brought back the affirmation of why I love reference as well; it was the right little reminder about how I feel about it. The recognition was appreciated, though I certainly didn’t feel like I was the only one in the room to think what I wrote in that note. The other highlight was Battledecks. I don’t really have words for this, only links. I am delighted that, while my body is weary, my mind is energized with ideas, projects, and future blog posts. On the car trip back from DC, I was making notes on my iPad to send to myself so as to not leave anything on the table. Once we are settled into the new apartment, I have a list of things that will claw for my attention. I hope to be able to satisfy them. This conference has given me the energy boost right at the time I needed it. If you are playing along with the LSW Badge game, be sure to pick up those badges that you have qualified for (or make some new ones and add them to the Flickr group) and add them to your site. As to a question posed to me, whether I would join ALA or not, I’m still on the fence. 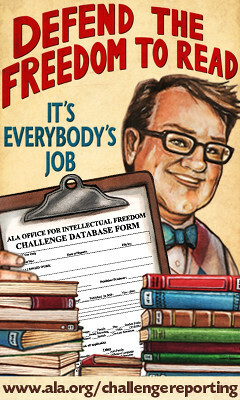 The issue revolves around whether to not join or, if I was to join, form a coalition of like minded librarians, run together as a slate for ALA Council, and change the organization. I will be crossing off one thing from the career bucket list: presenting at ALA. On Saturday at the Washington Convention Center (Room 203), I will be one of the speakers for the “Advocacy and Social Media” program sponsored by REFORMA and PLA. I will be giving the full account of the saga of the “People for a Library Themed Ben & Jerry’s Flavor” campaign, from the start to finish (virtual finish, because there isn’t much left to be done). For this talk, I’m going to be taking TED Commandments to heart; I hope to make it a fun experience for all those who attend. I’ve been refining my notes for the talk, but I’m having a hard time getting myself to settle down and give a few practice talks. I’m confident in the material that I have and the style I wish to present it in, but I have yet to time it out or figure out some of the smaller details. I find that rehearsing makes me more confident and relaxed for the real deal, but getting myself to settle down and rehearse… that’s another deal. Still, I will have something to say that Saturday and it will fill up 15-20 minutes of program time (or possibly 25). The other part of the appeal is the location itself; I’ve been meaning to visit Washington for a long time. As a history buff, it’s just one giant location loaded with items from the nation’s past. I’ve penciled in some tourist time, but it’s not a lot overall so I have to pick my sights carefully. Hopefully, I will not get consumed in the other activities (both conference and social) that I will not be able to take the time. But at least Washington is a short trip away from New Jersey, so I can always come again at a later time. For those interested, I have constructed a “ALA newbie” list on Twitter. You can follow the tweets of people attending their first conference. I’m looking forward to checking in on the list and see how other people’s experiences are going. I’ll see people in Washington. If you see someone who looks like this, be sure to stop me and say hello! My first thought was one word: “Really?” But as I thought about in the context of my own life, it made sense. When I graduated with my MLS, I was 29 going on 30. Librarianship was a second career, just as it was for a number of my peers at work. This also means I’m in the relatively large minority between the ages of 30 and 44; which, in using their numbers, is about 33%. To give a sense to this result, the number of librarians 45 and older is approximately equal to the population of Cheyenne, Wyoming, the 355th largest metropolitan area in the United States. Anyway, back to numbers with better backing; these statistics bring to mind a couple potential explanations. As I stated above referencing myself, librarianship is not often a first career choice. Like myself, I was doing other things (commercial horticulture and later law school) before I settled on the profession. There are a number of people that I know who did the same; they worked in a different field, it didn’t suit them, and went back to school to get an advanced degree. They came to librarianship as it held something that was missing or incomplete from their first career. In taking a second look at their occupation expectations, library science was closer to what they wanted to do as a career. Additionally, unlike the other sciences (both hard and soft), you cannot major in library science as your undergraduate degree. There is essentially no coursework connection from undergraduate to graduate for library science. It relies on people from other disciplines becoming interested in an MLS; not exactly the best manner in which to recruit people in the program. As the undergraduate major teaches you to think within that field, this can create its own disparity when approaching the library science mindset. Not all degree teachings are compatible, in my opinion, with that of the approach emphasized in a MLS graduate program. I have a couple of other ideas, but I think I need some more time to reflect upon them (and do some fact checking). So, what do you think is creating this age gap? I am very pleased to say that this blog was awarded First Place in the “Public Library Blog” category of the Salem Press Library Blog Awards. 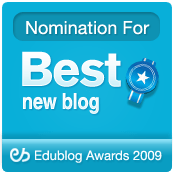 Considering the caliber of the other blogs nominated in the category, I am very humble to receive the award. I’d like to thank the people who nominated me, Salem Press for running the contest, and everyone who has been kind enough to compliment my writing (whether you agree with it or not). It’s the last of these things that gives me the confidence to keep writing; and for that, I really can’t thank those people enough.